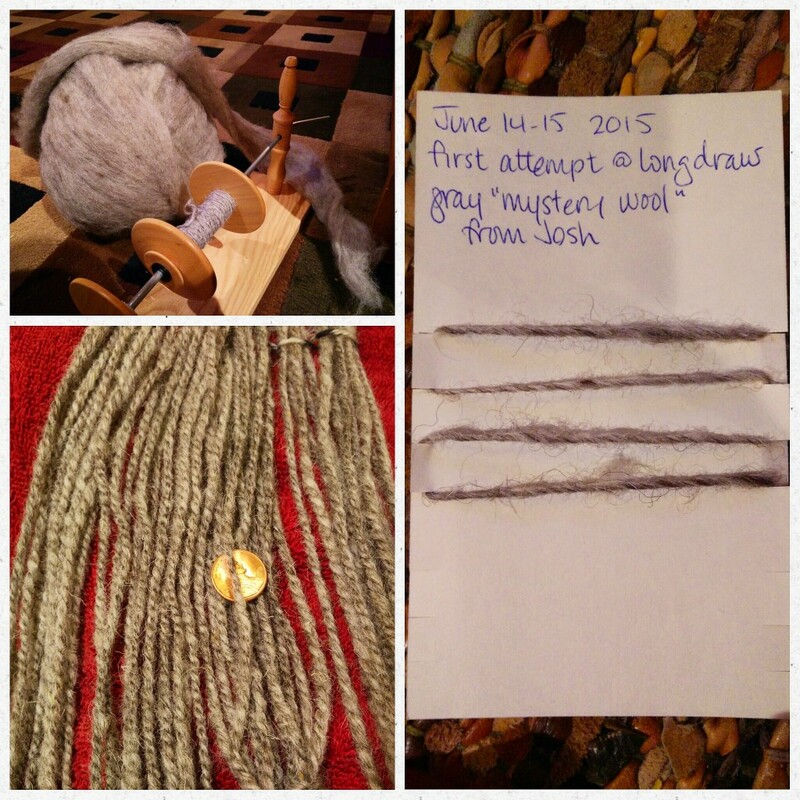 The Knitting Pirate » In Which the Pirate Introduces a New Wheel. « In Which the Pirate Spins the Blues. In Which the Pirate Introduces a New Wheel. 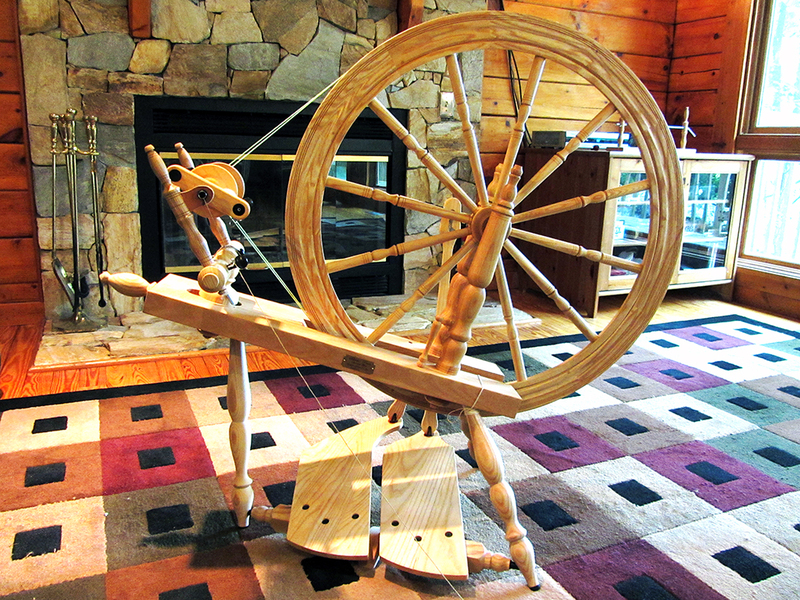 A week and a half ago, I went up to Connecticut to check out a 30" Schacht-Reeves wheel with a Woolee Winder and every size whorl, and I fell in serious like. It's too soon to call it love, but I think we'll get there! She came home with me and I set her up in the living room without too much trouble. Her crank had flexed by a millimeter or two in transport, which was causing one of the footmen to rub, but I was able to gently bend it back into place. She's running smooth as silk now! My next problem was finding the right kind of string in my stash to use for a driveband. I could swear that I had some #3 crochet cotton around, but it's all disappeared, and the #10 is too fine. Eventually I went with some leftover Sugar 'n Cream - it's a little thicker than ideal, and it stretches annoyingly, but it works for now! The wheel and I got further acquainted by plying the rust-and-cream singles, which almost matched up in length and almost entirely fit on the Woolee Winder. I adjusted that so it would wind more evenly, and decided to make use of the fast whorl to add more twist to some Rambouillet singles I'd spun up forever ago. My original plan had been to chain-ply those, but the singles didn't have enough twist to stay together while plying. Frustrating! Then I'd thought to just wind off the singles and make a slightly fulled laceweight yarn, but that's not the kind of thing I'm ever going to knit with. So, in not very much time at all, I ran 'em through the S-R and added twist where necessary. I'm glad I did, because some spots were really underspun and some were almost wiry-hard, and now everything is more even. I also got to test the Woolee Winder bobbin size and found that they have easily as much capacity as the ones for the Kromski - *and*, as a bonus, they fit on the Kromski's tensioned lazy kate! In keeping with my theme of naming wheels for qualities on which I'd like to meditate while spinning, I'm leaning towards calling her "Persistence." What do you think? This entry was posted on Tuesday, June 16th, 2015 at 11:08 and is filed under spinning. You can follow any responses to this entry through the RSS 2.0 feed. Both comments and pings are currently closed. It's lovely! My first wheel was a double-drive that we found at Goodwill, of all places. It had one bobbin and only one set of whorls, but it was a great starter wheel. Later I found an old Ashford traditional at an antique shop for a really good price and eventually sold my double-drive when I needed to winnow down my spinning supplies a bit. I still liked it but wasn't getting much use out of it at that point. It'd be nice to have a more versatile double-drive someday, though. Interestingly, I also have an Ashford traddy - but I never spin on her. I'll probably give her a tune-up and then let her go to her next person. She deserves to be loved and used for more than just decoration. You relate to your spinning wheels the way I relate to my harps. As for naming, why not spin on her a bit longer, and let her tell you her name? That's kind of the way my harps get named. I play them until something has whispered a name to me. If I name them before that, the name ends up changing to what the harp dictates.